WhatShed knows the struggles of those wanting to buy a log cabin all too well. The options available are mind numbing in their quantity and without knowledge of construction methods and materials, it can be a real challenge to know that what you’re buying is of a high quality. 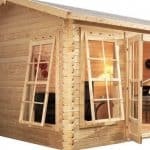 We create reviews like this one for The Zeta 44mm log cabin by TigerSheds to help the shed and cabin-buying public. With real-world site visits informing them and years of experience in the trade, we’re confident that we’ll find the right cabin for you. As mentioned, today we’re looking at a pretty spectacular cabin – The Zeta from TigerSheds. Immediately, attention is drawn to the buildings frankly stunning apex roof. An absolute behemoth of a structure, this really helps give the cabin the feel of a cabin deep in the wilderness. It’s also functional in that it provides ample storage out of the way of the cabin’s users. In this review, we’ll be analysing the construction materials and methods used, as well as the optional extras that can be added to The Zeta for a price. By the conclusion, you should have learned everything you need to help you decide if this cabin is for you. Let’s begin. Classic good looks. That roof really is impressive! Timber milled by TigerSheds in Yorkshire. Treatment not included in the price. Difficult to use sales module. The Zeta is available in nine different sizes as standard. These are listed below. We were particularly drawn to 14’ square version – surely a worthy centre piece for any garden! As you’ll discover in this review, we loved the fact that TigerSheds owns its own mill. The advantages to this are numerous. The first we’d like to draw your attention to, however, is the fact that TigerSheds will offer to completely customise the dimensions of The Zeta for an additional fee. Of course, those manufacturers importing materials will struggle to offer such flexibility. Thanks to its frankly enormous apex roof, The Zeta stands at a colossal 2822mm in height. For many customers this will add to the cabin’s appeal since the spacious roof not only offers loads of headroom but additional storage page to boot. That said, the structure may fall foul of some planning regulations, which state that garden buildings must be under 2.5m tall if they are within a 2m radius of a house. 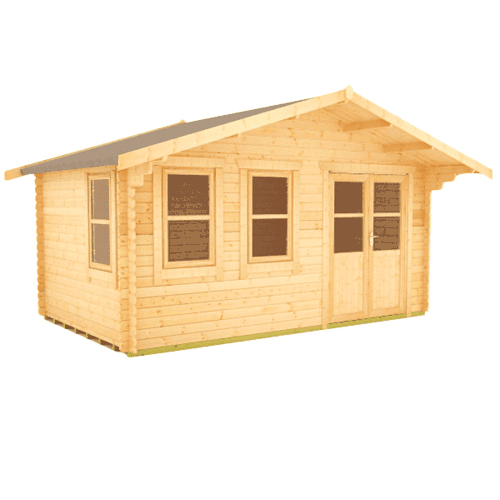 Now, TigerSheds does offer to reduce the height of any of its cabins to remain compliant with this regulation but given the roof design, this may comprise the functionality of The Zeta. The only way to reduce the height whilst maintaining the grandiose roof shape would be to lower the walls. To make the structure less than 2.5m, this would mean a massive 322mm was cropped from the height of the walls. As you can understand, this will make the cabin feel much smaller inside. 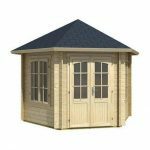 TigerSheds does offer loads of other models with different roof designs that do not require such drastic height reductions, however. 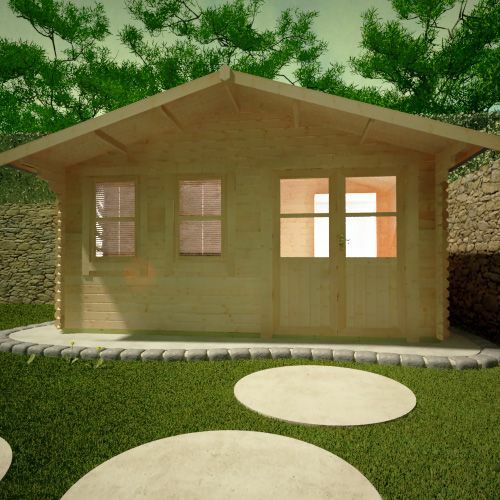 The entire 44mm range of cabins is constructed using slow-grown European softwood. Don’t worry though. This is just a name. The material is actually a great choice since it offers exceptional strength – particularly when compared with the inferior Baltic white often used by other manufacturers to save a bit of money. The resulting redwood cabin from TigerSheds is much less prone to warping and splitting than those favouring cheaper materials. Each of the logs comprising the cabin is beautifully finished and chamfered four ways. 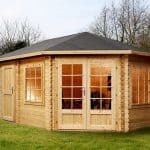 This is equally down to TigerSheds’s attention to detail and their superior choice of building materials. Another of the benefits of TigerSheds owning its own mill can be evidenced here too. The materials provided for The Zeta are all cut to order. This substantially reduces the likelihood that they will be stored in suboptimal conditions between being cut initially and be bought. The upshot is a higher change of a great quality cabin with no need to replace components. All cabins must be treated within 14 days of construction. Realistically, however, you will want to get this job done as soon as possible. Treatment must be bought separately when buying a cabin from TigerSheds. This somewhat irked us since the products are priced in the four-figure range. It seems a little harsh to not include a treatment product for a few extra pounds! That said, the company does carry two different spirit-based coatings for customers to add on if they choose to. The first is its own line – TigerCare. This comes in five litre containers and is available in clear, as well as the following natural colours: Red Cedar, Mahogany, and Dark Oak. 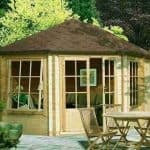 Alternatively, if you were wanting a slightly flashier looking cabin, one of Cuprinol’s Garden Shades range can be included. The colours offered are Seagrass, Pale Jasmine, Forget-me-not, Summer Damson, Olde English Oak, and Black Ash. Each of the walls of The Zeta is constructed using 44mm interlocking logs. These are connected using a double tongue and grove joining system. The single tongue and grove or even square cut notch joints offered by some competitors simply cannot offer the same rigidity or protection from the elements. These inferior choices are certainly cheaper, but the resulting cabin is of a much lower quality overall. Each of the timbers used for the walls is four-way chamfered. This is a prime example of TigerSheds going over and above what they strictly needed to do. This small touch really adds a lot to the cabin’s quality feel. Matching the walls in terms of rigidity and weather-resistance is The Zeta’s spectacular roof. Being a traditional apex, the thing is simply vast and gives the cabin a lot of its aesthetic appeal. Naturally, being such a tall roof, much of the space within can also be utilised for storage. The Zeta’s roof is built using 44x120mm purlins, which support 19mm tongue and groove roof boards. This frame is also rebated, meaning it is far more resistant to adverse weather conditions. Unfortunately, we couldn’t view The Zeta’s roof in all its splendour when we visited the TigerSheds showroom in Leeds. However, we did manage to give a thorough inspection to The Shere, which features a grandiose roof construction akin to that of The Zeta. We can happily report that the roof on this similar cabin is entirely gapless and being able to see the chunky purlins from within really fills us with confidence of the overall integrity of the structure. On the entry-level Zeta, the roof is covered with a heavy-duty mineral felt. Again, we got a good look at this when we visited TigerSheds and we’re more than satisfied with its inclusion within the listed price. We have experienced other manufacturers neglecting to offer such a high-quality covering as standard. In fact, we’ve even seen no covering be included at all! For those wanting to add a splash of colour and/or additional durability to their cabin, TigerSheds does offer shingles as a roofing upgrade. These are just like the ones typically used on houses and have an exceptionally high bitumen rating. The shingles are available in green, black, brown, and red. They can be added to the roof by simply nailing to the boards. In addition, guttering can be included at an extra cost. Just like the shingles, TigerSheds have made it as easy as possible to add this upgrade to The Zeta. It simply requires a couple of screws or nails. One of the stand-out features we have omitted to mention about The Zeta’s roof is the fact that it features a stylish and practical 600mm overhang at the front. This can serve as a small porch area to provide shelter from a light shower and helps to protect the structure itself. Oh, and it also really adds to the building’s classic log cabin aesthetic! TigerSheds’s commitment to quality extends beneath the feet too. The flooring provided is simply exceptional. The entire 44mm range uses the same materials and construction methods and each of the three we saw (The Rho, The Procas, and The Shere) all provided equal measures style and sturdiness. Supporting the 19mm planed floorboards is a 44x57mm tanalised (pressure treated) frame work of bearers. These are spaced at 400mm centres – a spacing common in the construction of homes. 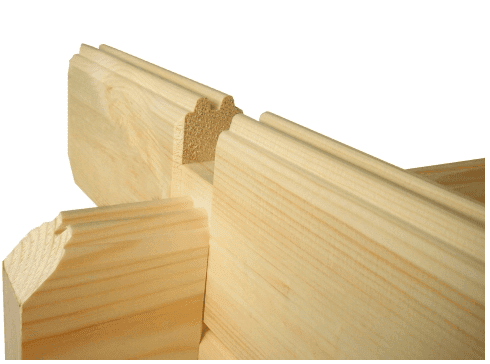 The boards themselves fit together using TigerSheds’s preferred system – tongue and groove. The importance of a quality floor in a cabin really can’t be stressed enough. It is from beneath that many inferior cabins let in moisture and this can ultimately rot the structure. Often, manufacturers will skimp on the floor in their entry-level models. Once a customer is interested, they will then reveal that the floor is only constructed using 11mm floorboards or that the bearers will need treating at an extra cost. Worse still, we’ve even seen suppliers state that no floor is included! Fortunately, TigerSheds employs none of these arguably sneaky tactics. As you can see from the above specifications, the floor in The Zeta is of an exceptionally high standard. It is more than hardwearing enough to withstand all that average cabin use will throw at it. However, those wanting to use the space as a tool shed or workshop might consider an upgrade to the floor’s thickness. This is by no means necessary for a wonderful, long-lasting cabin for everyday use, however. The windows and doors on The Zeta are from the simplistic, yet stylish European range. The building features three fully opening windows and a set of large double doors. These design choices really make the inside space ideal for those wanting to invite as much natural light as possible into their cabin. Additionally, the spacious double doors make moving furniture inside and out of the cabin effortless. Each of the European style windows and doors on The Zeta is joiner crafted and this is obvious from several beautiful and above-the-strictly necessary touches. Architrave both inside and out, the snug fit, and recessed hinges are but a few of the many examples. 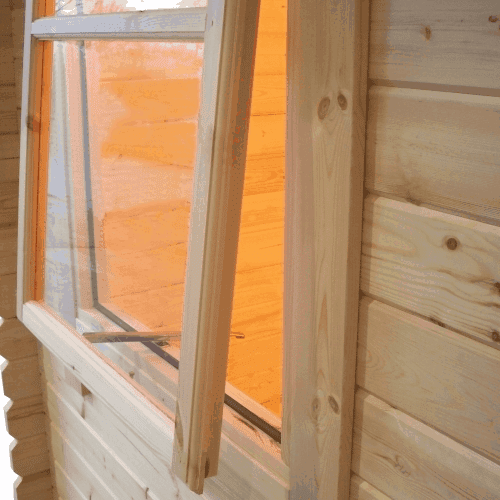 In terms of glazing, The Zeta log cabin is supplied with 3mm glass as standard. For an additional cost, this can be upgraded to 4mm toughened glass. Alternatively, highly insulative double glazing can be added. All these glazing options are of a wonderfully high standard. Even the 3mm entry level product is fully draft sealed and beaded both internally and externally. Some of TigerSheds’s competitors will cut corners when it comes to their windows and doors. Finishing touches, such as architrave, might be lacking, and they may use inferior pin hingers, or be externally hung. All these design choices do little for the customer and only serve to save the company offering them a bit of money. Ultimately, the cabin produced using such materials and construction methods will be less pleasing to look at, easier to break into, and less resistant to adverse weather conditions. Georgian – traditional, compliment The Zeta’s style nicely. Full pane – contemporary and the ultimate in terms of natural lighting with The Zeta. PVC – the most insulative and secure windows offered by TigerSheds, double glazing as standard. Fully boarded – without glass for a practical workshop style. In terms of security, keeping the contents of The Zeta safe is a three-lever mortice lock as standard. This can be upgraded to a five-lever lock. We were impressed by TigerSheds’s decision to include such a secure locking mechanism on the entry-level model. Many competitors will only provide much cheaper cylinder locks that simply do not offer the same level of peace-of-mind. In addition to the extensive customisation options listed above, customers can also include either decking or planters with their log cabin. These are constructed to the same high standard as can be observed throughout the rest of the build. 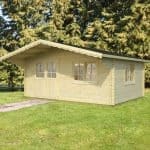 TigerSheds offers customers absolutely loads of choice to design the cabin of their dreams using one of their designs as a base. However, an issue with this is that it isn’t immediately obvious how to include such features when ordering online. Even some of the basic upgrades seem to have been missed off the sales module. This prompted us to contact the team at TigerSheds to clarify if they did indeed offer all these additional extras. They informed us that they did. Therefore, customers wanting to tweak any aspect of The Zeta’s design should enquire using the Live Chat on the website or call the company direct. As if producing an exceptional quality building wasn’t enough, TigerSheds once again goes the extra mile when it comes to delivery. The company provides a full professional delivery service as standard. This includes unloading via a crane, which is much less likely to result in damage to a component than when the same service is attempted by hand. Customers can choose from a list of two-hour drop-off times to help fit the delivery around their own schedule. Again, top notch customer service, Tiger! In terms of installation, every effort has been made to make sure that the finished cabin is as easy to erect as possible. It therefore does not require professional assembly. 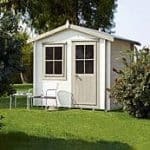 However, this service is offered for those who are getting on in years, suffer some mobility issues, are less confident at their DIY abilities, or just want TigerSheds to take full responsibility for every aspect of their new cabin. The installation service isn’t cheap, but it is performed by TigerSheds’s own team of professionals. These guys really do know these products inside and out and will have your Zeta cabin up in no time! To conclude, The Zeta is a breath-takingly beautiful cabin that is unmistakably vintage in its appearance. The lofty roof of the building is certainly its standout feature and helps to make the structure feel like some remote log cabin, as opposed to a domestic garden building. The superior craftsmanship that goes into the 44mm range from TigerSheds is evident in countless examples. The company makes no effort to cut corners in terms of construction methods or building materials and this shows from just how hardwearing and ultimately stunning the finished products are. Perhaps the only drawback of The Zeta is also one of its best qualities – that roof. Some people might have to pass up on this outstanding building in favour of one with a less imposing roof, simply because reducing its height would reduce the headroom to an uncomfortable level.